Walking into the Stockade in Swift Current, a building I walk into at least twice a week for my son’s soccer, I was struck dumb at the sights and sounds before me. 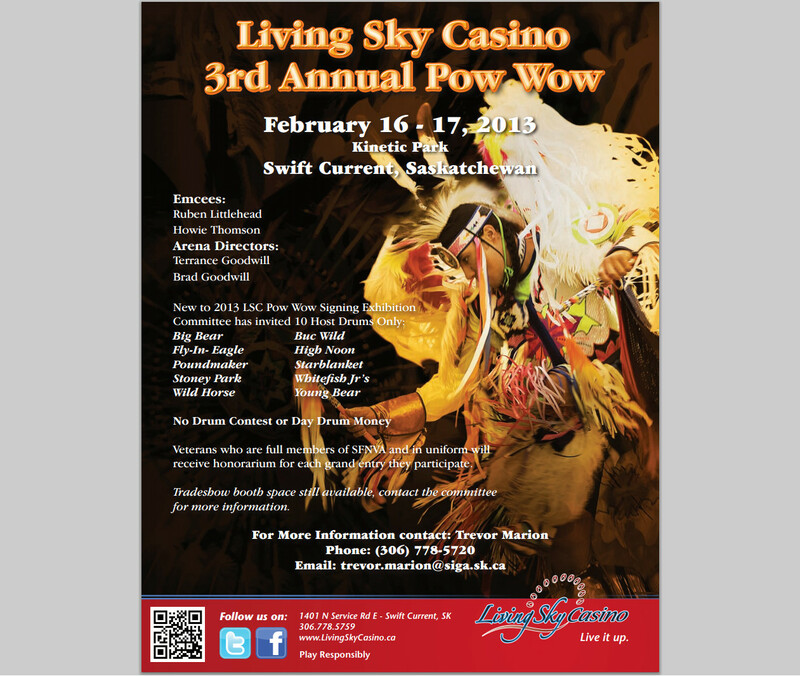 In the course of the two days since I had last seen it, the City of Swift Current Stockade, had been transformed into a cultural arena the likes of which I have never before seen, nor heard, as the 3rd Annual Living Sky Casino Pow Wow got underway. 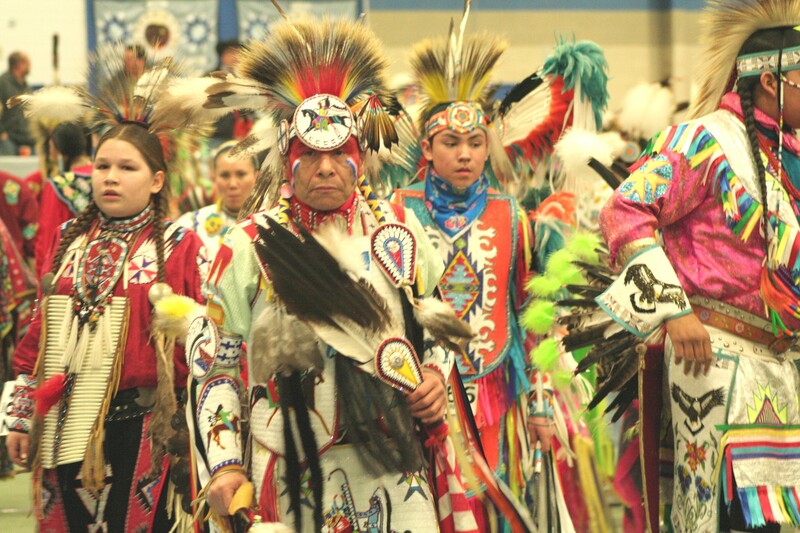 The pounding of the drums, the voices raised in unison and the colourful regalia of First Nations people from around western Canada and the western United States all equaled one thing – pure spectacular energy. Like most westerners, especially those of us on the Prairies, I think I believed that I knew all that I needed to know when it came to the traditions of our First Nations people. But one foot inside the door, as I witnessed the hundreds of First Nations people who had traveled from Colorado, Montana, Alberta, Manitoba and elsewhere in Saskatchewan (and those were just the license plates I saw in the parking lot), and I knew that I had never before seen anything like this. Drummers by the dozen sat in circles, awaiting their turn to play. 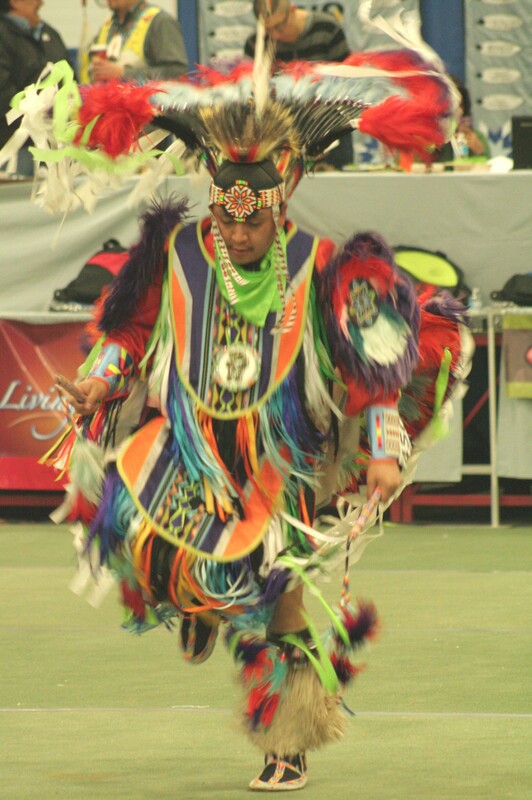 Dancers filled the circle in the centre of the arena, numbers affixed to their colourful regalia, some of which must have easily cost hundreds if not thousands of dollars. Little did I know until later, the numbers signified them as competitors, who would partake in dance competitions throughout the weekend. 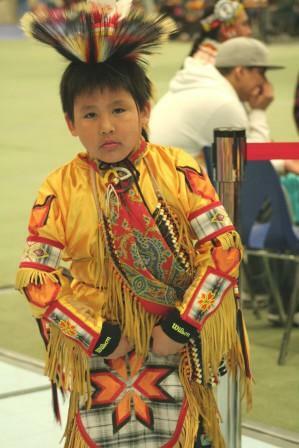 For First Nations People, PowWows are social gatherings where they can dance, sing and celebrate their culture. For those like me, it’s a chance to learn more in one afternoon, than I had known in a lifetime, though sadly I was too late to witness the majesty of the Grand Entry. Though considering the amount of etiquette I was woefully unprepared for, it was probably a good thing. The Grand Entry to a Pow Wow is like the Opening Ceremonies to any major sporting event. As the representatives of the many nations are brought in, all spectators are asked to rise, and each nation, family or community’s flag and eagle staff are brought in. The drums then begin a grand entry song signaling that the Chief (or chair) of the host tribal committee and any visiting dignitaries may enter the arena. Next will enter other honoured members and the colour guard of veterans, any elected royalty, and the youth representing their specific community. Next come the elders who lead the dancers in. 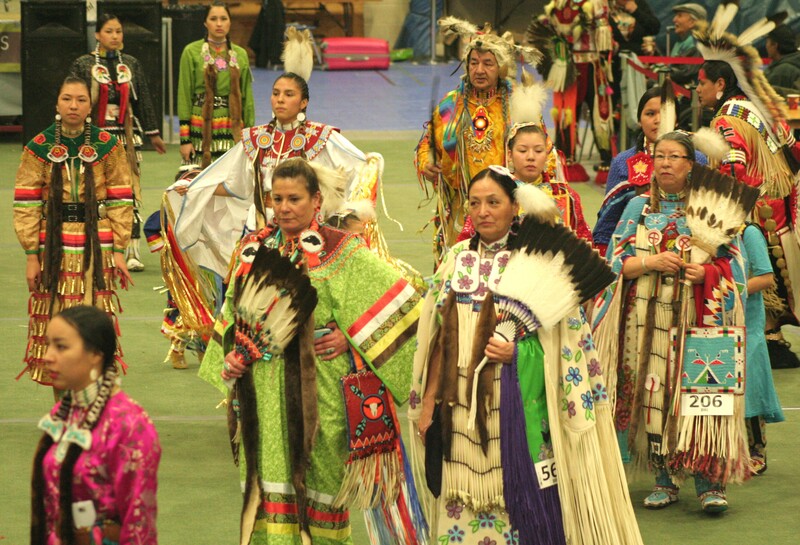 Men first, in a particular order of dances, followed by the women’s dancers, led by women elders. Then come the male and female teens, and the male and female children, finishing with the tiny tots. They don’t call it a Grand Entry for nothing. And what a sight it is when you see the arena full of dancers, with each drumming circle taking it’s turn at ushering them all in. Even the youngest dancers took part. 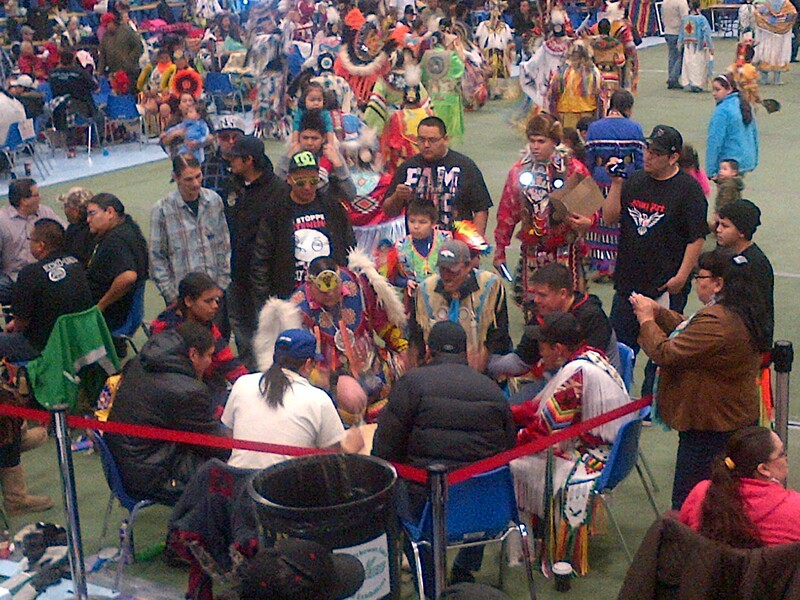 Having never been to a Pow Wow before, I don’t know if the selling of drumming CD’s, or other regalia pieces is common, but it was interesting to see the sellers circling the arena with a wide variety of merchandise for those in the stands to buy. 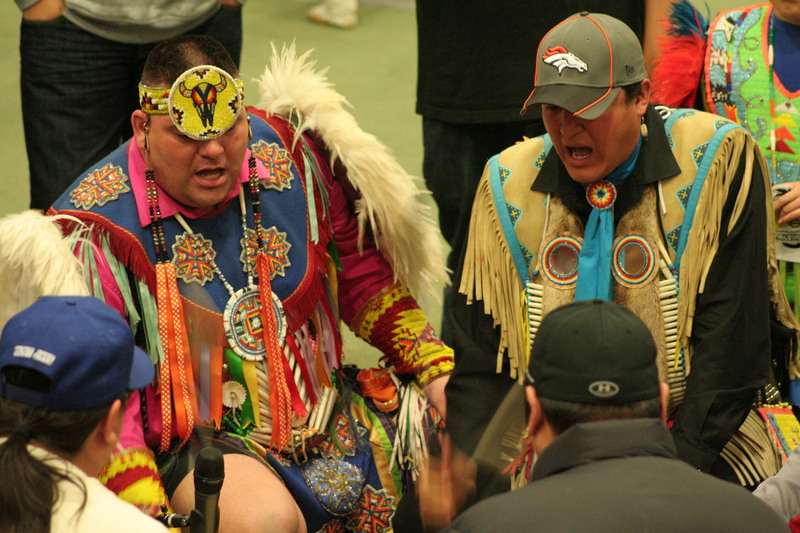 At this particular Pow Wow, they also were able to use the Palliser Pavilion next door to host a mini-trade fair, where everything from intricate beaded works and jewelry, to novelty t-shirts, and even toys to keep children amused in the stands, were offered up for sale. Unfortunately I did not have the opportunity to just plunk myself onto one of the stands and spend the afternoon listening to and watching the festivities, but make no mistake, next year during Swift Current’s 4th Annual Pow Wow, I’ll be rearranging my schedule so that I can “GoHere” for a much longer period of time. Good to Know: Guests are always welcomed to a Pow Wow and admission is free, but as mentioned there is a lot of etiquette to follow. Here are just a few of the most important. When the eagle feather is brought in during the Grand Entry everyone must stand and remove their hats as a sign of respect. Pay close attention to the Master of Ceremonies, as he will help guide you throughout the program on the proper etiquette required – follow his lead. There is a circle in most dance arenas representing the circle of unity and the cycle of life, when dancing in the circle, if invited to do so, you must always follow the clockwise pattern of the sun. Never ever call the immaculate regalia worn by the dancers “costumes” – instead refer to them as regalia. Some of the ornaments worn by dancers have special significance. If you happen to be speaking to a dancer, be sure to ask what significance their ornaments have. Be attentive, be respectful and when the opportunity presents itself be inquisitive and ask questions of the participants. You’ll be the richer for it.